A blog about students and teachers in South Central L.A., the U.S. and other interesting places. Being on strike makes me proud. 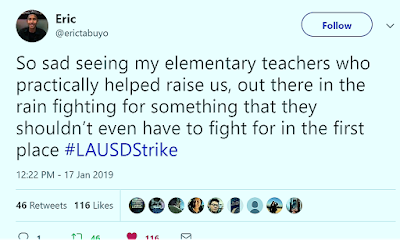 To see and hear the support of the public every morning on the picket line, I am further convinced L.A. teachers made the right choice to leave the classroom. It is not an easy choice for many single income teachers, but it is one of the reasons we are striking. Teachers should not have to live paycheck to paycheck when educating society's children. But our strike is about more than that, and it seems the public is aware of what we have been concerned about for years. In the middle of one morning's picket session I realized that the education reformers had been so very wrong in what they were telling us. The public knows and understands that we know what's best for children in schools. They place their precious children in our hands to educate, and want us to do our job unencumbered by district edicts and structures that get in the way. When talking with some retired teachers about how students have changed in the last ten years, we commented on how the internet has made communication as simple as the click of a button. People have access to information that you used to have to work hard to get, and it doesn't take long to get it either. You type in a search term, and thousands of sources of information are at your disposal. This post isn't about the quality of internet resources, but of a realization that technology has exciting implications for students and teachers all over the world. 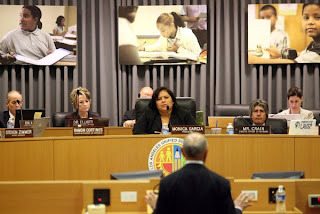 Today, the Los Angeles Unified School District School Board voted on which organization they would select to govern 36 new and "underperforming" schools. Charter schools had submitted several bids, all but one for new schools, but were only selected to govern four new schools. Coverage here from L.A. Times. But they wanted more schools. And they're mad. @parentrev (the Parent Revolution is a "parent activist" group with paid organizers on staff, closely affiliated with Green Dot charter schools) on twitter fumed, "LAUSD proved again today why parents can't count on politicians to bring change. Parents will use parent trigger & transform their schools." 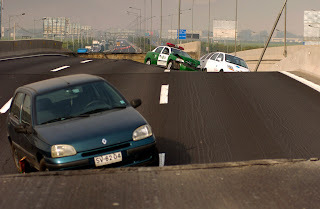 This commentary was written by Sergio Flores in response to KPCC's article on the L.A. Teacher Rallies we wrote about in the previous post. His analysis is right on the mark, and highlights the parts of the process (if not the entire process itself) that defy logic and reason. Thank you, Sergio! Please email our blog so we can keep in touch with you at dontforgetsouthcentral@gmail.com. For public school educators in Los Angeles, and California in general, the bidding for public schools in LAUSD has brought tragedy, shame, and a powerful warning to all other districts in the state. In a political atmosphere saturated with misinformation and false premises and promises, public schools are offered as if they were cast-off commodities to the best bidder. After years of living in unfair scrutiny and infamy, thousands of students, parents, teachers, administrators, and communities go through an ignominious path which leads most of them towards an even more uncertain future. Some teachers are ambivalent about continuing to participate in UTLA rallies. RIF'ed teachers wonder whether anyone remembers that they have lost their jobs as permanent teachers and are working as long-term substitutes (if they're lucky.) When you put your heart and soul into your job, when your life centers around your persona as a teacher, you feel like your world is upside down in the wake of the loss of your job. But does anyone even remember that L.A. Academy Middle School lost 23 teaching positions 7 months ago? That South Central bore 40% of the layoffs due to its large number of new teachers? What is really going on with public education today? Are public schools really failing, or are they being portrayed as failures in order to set them up for corporate take-overs? The public has the right to know that they are being led down a road to the elimination of the middle class, in the corporate world's quest for massive profits via the privatization of the public sector. In other words, selling schools=more money for rich people. It is in someone's vested interest that our public schools fail. And it ain't the teachers and the students. Issues related to Los Angeles schools, social studies education, gifted youth, and the teaching profession! #Fulbright fellow.